Photo by Ian Saint: Zoe Gubbels, sophomore, tosses the ball high before her serve. The Belles took the win over University of Texas Permian Basin 6-1. 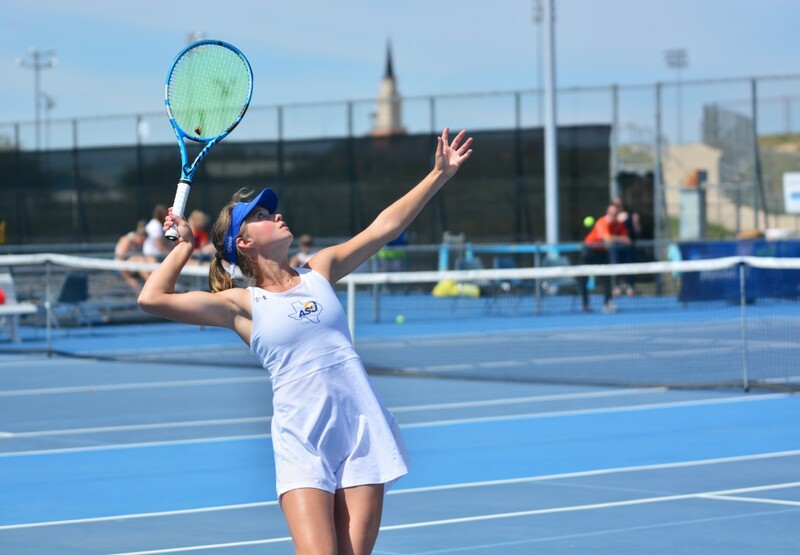 The Belles tennis team on March 22-23 earned two wins against Western New Mexico University and UT Permian Basin to begin the Lone Star Conference play. In Friday’s match, ASU shut their opponents out 7-0 to move to 1-0 in the LSC on the season. Sophomore Valentina Gonzalez and freshman Ena Ovcina started the doubles with a 6-1 victory. Freshmen team of Zoe Gubbels and Virginie Becht won 6-1, as well. Freshman Lucia Maitrot and sophomore Maria Delgadillo beat their opponents 6-4. In the singles play, Gonzalez won 6-1, 6-3 and 7-6. Ovcina won 6-2, 6-2 and Delgadillo won her match 6-3 and 6-1. Gubbels won 6-0 and 6-2. Becht won 6-1, 6-1. Maitrot closed it out winning 6-1 and 6-2. In Saturday’s match, the team earned another LSC win over the UTPB Falcons 6-1, moving to 2-0 in the LSC play. The Belles took the doubles points with Gubbels and Becht winning 6-1 in the No. 1 spot. Maitrot and Delgadillo won 6-4 at the No. 2 spot. Gonzalez and sophomore Melanie Dreux won 6-2 at the third-place spot. In singles, Gonzalez won 6-2 and 6-0 at No. 1. Delgadillo won 6-1 and 7-6 (1) at the No. 2 spot. Gubbels won her match 6-0 and 2-0 at No. 3. Becht won 6-1 and 6-2 at No. 4. Maitrot won 6-4, 6-4 at No. 5. Dreux had the Belles’ only loss 4-6 and 1-6 at the No. 6 spot. The Belles will return to the ASU tennis courts on April 4 at 3 p.m. to face Midwestern State University.